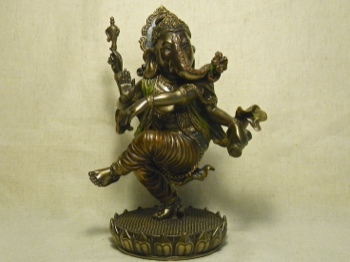 Beautifully intricate Ganesha in an ornate costume dancing with power and grace. This wonderful cold cast figurine is resplendent with fine design details: wrinkled robes, lightness of foot, luxurious smooth skin and dainty fingers. The designer has obvious love and respect for this highly reverred diety. 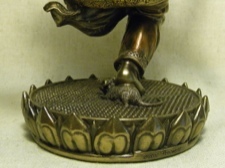 Why is the Ganesha dancing? 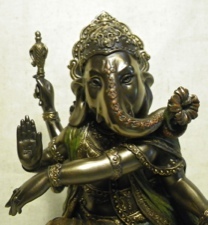 As the patron of arts and sciences, Ganesha is said to love dance and music; but also he wants to honor and delight his father Shiva, the Lord of Dance. His dancing is considered a reflection of wisdom and joy. 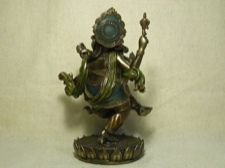 This jubilant statue is 8 inches tall on a round base of 3.5 inch diameter.